Etesia ME53C mulch mower used by Eco Garden Maintenance. 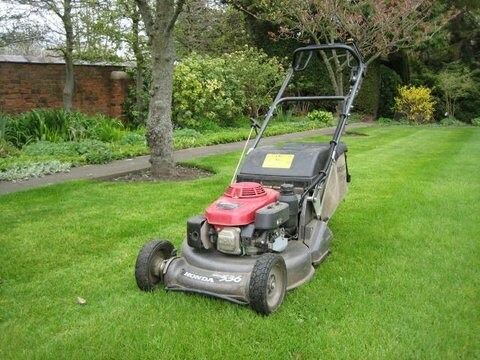 Eco Garden Maintenance provide professional lawn mowing and grass cutting services to domestic and commercial clients in the Leeds, York, Selby, Tadcaster and Wetherby areas. In most gardens the lawn takes up the majority of the space and can be subject to neglect, heavy traffic or poor mowing and maintenance practices. The lawn is usually the centre piece of a garden and so needs to look its best, especially through the summer months when it is used and viewed the most and is often under stress. A beautiful lawn is certainly a site to behold and Eco Garden Maintenance (Tadcaster) are experienced and skilled in producing one that will be the envy of your friends and neighbours. We mow and maintain many lawns and open spaces in the local area for both domestic and commercial clients and realise that different customers and gardens have their individual needs. This is why we tailor our mowing regime to suit your requirements and your lawn's needs. Grassed areas are all different and Eco Garden Maintenance will always choose the most suitable type of mower to effectively maintain your lawn or open space. Ideally lawns should be cut once a week, a healthy well maintained lawn will certainly require this if it is to look its best. Eco Garden Maintenance provide weekly and fortnightly mowing throughout the growing season but highly recommend a weekly cut because taking too much growth off at once can weaken and damage the grass. We cut the grass no lower than 25mm as scalping the lawn will weaken it and provide space for weeds and moss to take over. The grass needs enough leaf to enable photosynthesis and thus provide food for healthy growth of the plant. For ornamental lawns we use professional quality Honda rotary mowers with rollers which provide a perfect cut every time, along with the much loved stripes which are the finishing touch. Our stripes are so straight you could almost believe our mowers are steered by satellites ! Mulch mowing is a service we provide although it is only suitable when the grass is dry and not too long. For rough areas we generally use four wheeled mowers which are designed for use in these circumstances. 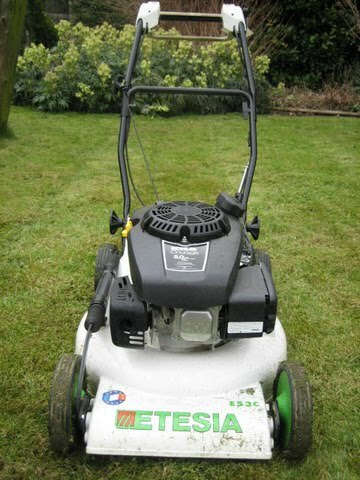 The Etesia ME53C mower as seen in the photograph below is highly effective at mulching and cutting rough grass. If a lawn is cut with a roller mower in the same direction every time the grass gets rolled the same way too much and tends to lay down in one direction permanently, which is not good. To combat this we regularly change the direction that a particular "stripe" is mown and where the shape of the lawn allows we change the orientation of the stripes occasionally. Trimming the edges of a lawn is very important and is a task which we undertake before mowing the lawn, either every visit or every other visit. This gives definition to your lawns and borders and stops the grass spreading to where it is not wanted. We perform this operation with our Pellenc battery powered strimmer unless there are overhanging plants , in which case we trim under the plants with edging shears. We can dispose of the lawn clippings if you so wish but why not make use of them by mixing with carbon rich material and making your own compost. However, if mulch mowing is adopted on your lawn there are no clippings to dispose of as they are chopped up finely and returned to the soil, thus supplying a free form of fertiliser and organic matter. Please contact Eco Garden Maintenance to enquire about our lawn mowing and grass cutting service and what can be achieved.